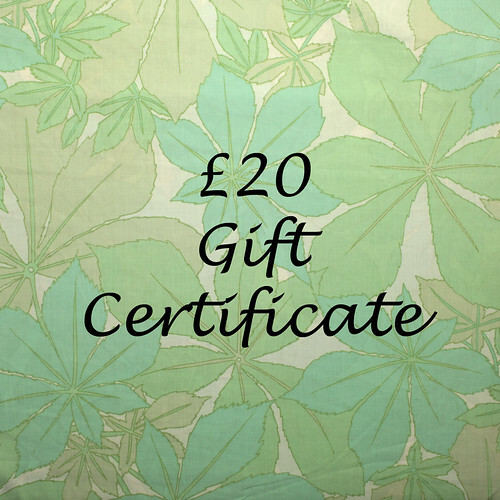 Welcome to my blog and the Sew Mama Sew giveaway day. I spend a lot of my spare time sewing and a little of my spare time hunting for vintage sheets; many of these make their way in to my etsy shop but I do sew with some of them. If you came here for the last giveaway day you may remember (but probably not) seeing blocks that were to become a Retro Flowers quilt. I finished it a couple of months ago and it is my most favourite vintage sheet quilt so far! To enter leave a comment below telling me which item(s) in my shop would you most like to buy if you won (just one entry per person please). If you can’t wait and want to buy something now you can use code SMSMAY15 to take 15% off your order (valid through to Sunday evening). Now go and have fun seeing what others are giving away. « Shirt for a birthday? What are the chances? You know my answer- all of it! I love vintage sheets. I’d have to have some of your lovely fat quarters. Thanks for the giveaway. Fat quarters for me too 🙂 Or maybe the charm squares…. I’d like to make a big HST quilt with these lovelies. Thank you for the chance to win! This giveaway day seems to come round quickly! It would have to be Charms, I have had them before and they make baby quilts so speedy to sew. I’d get the bunting. very pretty!!! Difficult… all of them id I could! I think I’d go for a pack each of 6″ and 5″ charms…I think! I love your shop! Maybe I would get the 84 pack of vintage charms. I’d buy some charmpacks or some jelly strips. All the fabric is lovely! I love the vintage sheet charm squares! So cute!! Great job on the quilt, it is just lovely. I love the sheet strip sets! Your retro flowers quilt is breathtaking! Thank you for participating in this giveaway! I would buy charms. 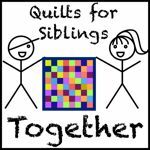 It just makes quilting more fun and a lot easier. Thank you for being a part of the SMS Giveaway Day and the chance to win that generous gift certificate. I do love fabric shopping. Thanks for the chance to win! I would probably go for a strip set as I’ve been working on some scrappy string quilts. What a beautiful Quilt! I love it! Thanks for the chance to win this awesome prize! Have a great Mothers Day! I like the 6-inch charms best! I would have to do a charm pack. Thanks! Oh my goodness, you have so many wonderful prints! I can’t decide if I’d go with fat quarters or charm pack, but I’m leaning toward the charms. Pink vintage, I think… but it’s so hard to choose! I’d get your largest set of charm squares and your bunting kit! I love vintage sheets! I would get the charm squares or the stripe fat quarters. Thanks for the chance to win! 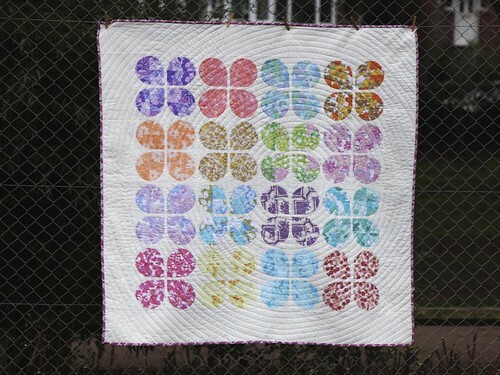 Your quilting on the retro flowers quilt is amazing and I love how you used the vintage florals for it. 3 vintage sheet fat quarters in green! How can a person choose?! It is all so beautiful! I love vintage sheets! I would have to get some vintage sheet fat quarters to add to my collection. I am saving them to make a quilt. I’d choose multiple sets of charms — what I would really like are sets of four so I could make my own version of your Retro Flowers quilt. I’d put the gift certificate towards a vintage sheet baby quilt kit. Oh, my! I love, love, love, vintage sheets! I just got finished making my mom a duster robe with one. You have so many beautiful choices, but I think I would get the 10 Vintage Sheet Fat Quarters – mixed. Thank you for participating in the giveaway day! Oh my… your fat quarter bundles are all so happy. I would definitely pick one. I collect vintage sheets, too, and I love the stripy fat quarters. I started collecting vintage sheets this winter and NONE of them are anywhere as nice as you sweet collections!!!! If I won I would put my winnings into some of those wonderful FQ bundles!! Gorgeous!! Thanks for the chance! Loooove SALL the things in your Shop! lol But think I would get several of the Charm bundles! Loooove vintage sheets! So many nice fat quarters bundles! Hard to choose 🙂 but thanks for the chance! I love the charm packs of vintage sheets. Purple is my favorite color! Charms for sure! Love your quilt! I would definitely go for one of the larger charm packs to make a quilt. Absolutely lovely vintage fabric. Thanks for a fabulous giveaway!! Vintage Sheet Bunting Kit would be so neat! Great fabrics – I would definitely choose some charm squares. I’d like to buy a set of fat quarters. I love your Retro Flowers and I’d love to make one (I already have the pattern!!) so some mixed FQs would be great! I would choose the fat quarters. I love the bunting set or the 6″ charms – and the purple set is gorgeous too!!!! I love the vintage FQ- All of them 🙂 Thanks so much for this great giveaway!! I love the purple sheet fat quarters. I love the vintage sheet sets! Some charm packs I think. But not 100% sure! Love the fat quarters….too hard to decide which ones. I think I’d go for the pack of 84 charms. Thanks for the chance to win! I would get the 6″ vintage sheet charm squares pack of 42.I love the floral design. I don’t know if I want fq’s or charms. I would get some charms. There are some fat quarters I cant resist. I love a pack of three Vintage Sheet Fat Quarters in green. They are lovely. Mmmm, hard to choose! It would have to be some FQs, any of them! I really like the purple FQs. I would purchase some charms! I’d definitely pick up some fat quarters. I love vintage sheets! I’d pick up some fat quarters! The vintage sheets in your shop are beautiful. I would love to make a simple patchwork quilt with charm squares. I would buy the 84 vintage sheet charm squares. I love it when the cutting is done for me! I would choose the 3 geometric fat quarters or the 5 pink ones. So fun! I really like your Retro Quilt so I might buy that kit. Lovely giveaway so generous of you.Charms for me.Have a lovely weekend. I think I’d be buying vintage sheet fat quarters to make my own retro flowers quilt – though I fear my daughter might pinch it when finished! Many thanks for the chance to win! I would have to get the fat quarters – I saw a Swoon quilt made with vintage sheets that was just gorgeous. I love vintage sheets! The vintage sheet binding is a great idea and I think that would be my pick. Thanks for the chance to win. I’d choose some of the vintage sheet charm squares. Thanks for the giveaway! I love vintage sheets!!! I would buy the vintage baby quilt kit but it would probably be for myself! I like the five pink vintage sheet fat quarters.. the colors and the prints are pretty. I love the mixed charm squares and fat quarter sets. I have a hard time putting patterns together so these are perfect for me! I would love to buy all of your FQ collections!!!!!! Definitely the fat quarters you have for sale! ook, i love the vintage sheet fat quarter sets! I think I would go for the fat quarter vintage sheet bundle, or the charms.. I love your vintage sheets, I’d buy either a huge stack of charms or a FQ bundle. Thanks for the chance! the Vintage Sheet Baby Quilt Kit is such a good idea! really, any of your charm packs would be great. 4″ Vintage sheet charm squares x 42! Thanks for the wonderful give-away. I really like your etsy shop. I’d love to win one of your fat quarter bundles. They’re so colourful. I love the pink sheet fat quarters the best. Enjoyed learning about your site. I like all of your Etsy shop offerings but if I had to choose it would be a toss up between the 6” charm squares (45) or the 84 charm squares. Just love the variety in them. 10 Vintage Fat Quarters, would make some delicious and very feminine fabric basket for my vanity and bath caddy. One of those beautiful charm packs. I think I would buy the 6″ charm squares. They look yummy. I would go for some charm squares – I have some from somewhere else and I forget what size they are, so I would have to measure first! I would have to go for fabric, any fabric, so many options! Great giveaway, thanks for the chance to win, I have my eye on some vintage sheet FQs. I’ve some Vintage Sheet fabric as I don’t have anything like it!!! Thanks for the chance!!! Lovely project! I’ve never used vintage sheets so I’d probably grab a charm pack so I could play around. Thanks for the giveaway! It’s too tempting in your shop. I’d probably go for a bundle or some more bunting. My garden may end up full of vintage sheet bunting. Of course if I got a bundle I’d be making co-ordinating table cloth for outside use. HELLO, love any of your fat quarters ! Very neat shop! Ooh, definitely the purple vintage sheet collection.